Why did Koreans decided to change the name of Ulleungdo’s neighboring island from “Usando” to “Jukdo”? Maybe the Japanese names for the small island influenced the Koreans in some way or maybe Koreans just felt that “Bamboo Island” (“Jukdo” in Korean and “Takeshima” in Takeshima) was more descriptive? In a 1692 document, HERE, Japanese fishermen reported that they landed at a neighboring island of Ulleungdo called “Ika-shima” (イガ島 or いか島), where they found a large catch of abalone that had apparently been left there by Koreans who were fishing in the area at the time. The 1724 Japanese map to the right shows that Ika-shima (イガ島), based on its location, was Ulleungdo’s neighoring island of Jukdo, which was called Usando by Koreans at the time. The 1692 document is evidence that both Japanese and Koreans were visiting Ulleungdo’s neighboring island of Jukdo and may have been using it as a base for their fishing operations. 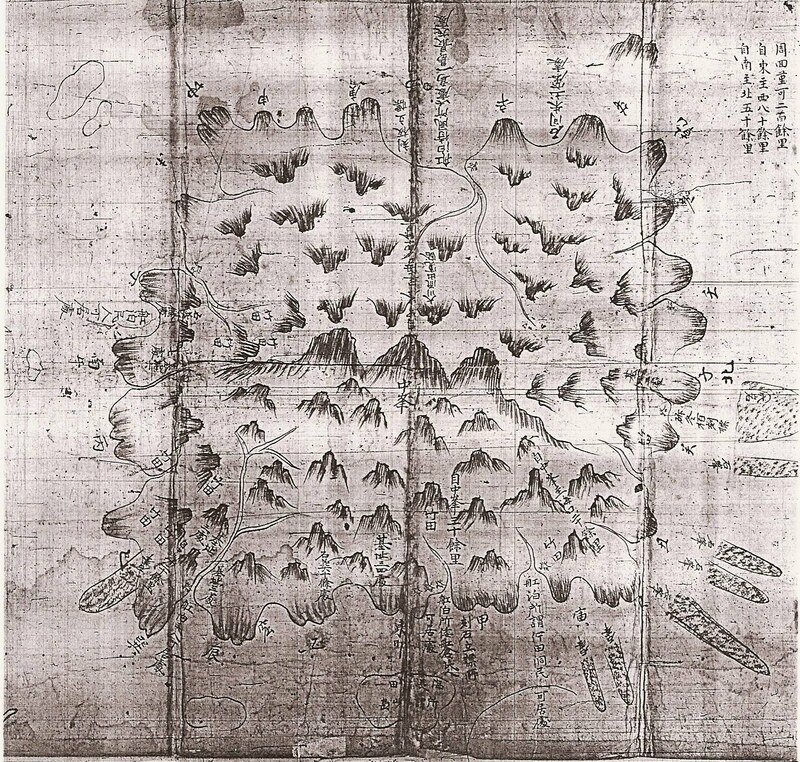 The 1724 map to the right also shows that the Japanese at the time were referring to Ulleungdo as “Takeshima” (竹島), which is pronounced as “Jukdo” in Korean. Notice how things are starting to get confusing. In the past, Japanese used “Bamboo Island” (Takeshima) to refer to Ulleungdo, and today Koreans are using “Bamboo Island” to refer to Ulleungdo’s neighboring island of Jukdo. Adding to the confusion, today Japanese use “Bamboo Island” (Takeshima) to refer to Liancourt Rocks, which Koreans call Dokdo. In the Japanese/Korean territorial dispute over Ulleungdo in the 1690s, the Korean side claimed that Korean fishermen also used the word “Jukdo” (竹島) to refer to Ulleungdo, though there are no Korean maps to support that claim. Whether the claim was true or not, by the 1800s, Koreans were using both Usando and Jukdo to refer to Ulleungdo’s neighboring island. Again, why did Koreans start using “Jukdo” to refer to Ulleungdo’s neighboring island? Inspector Jang was almost certainly referring to Ulleungdo’s neighboring island of Jukdo, which is about 2.2 kilometers off Ulleungdo’s east shore. 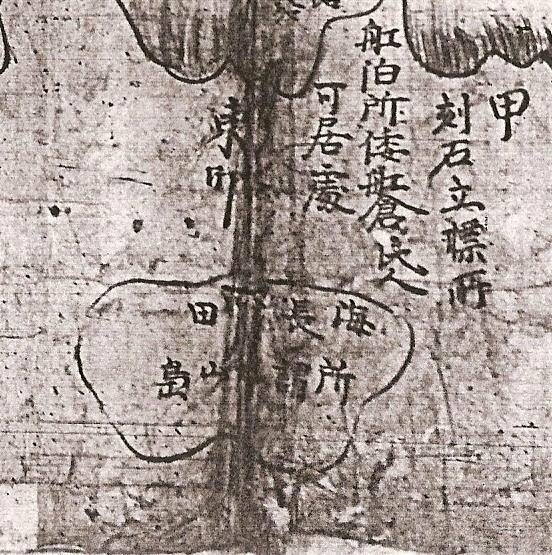 Notice that he mentioned that haejang bamboo was growing thickly on the island, which agrees with what was written on the 1711 Korean map above. 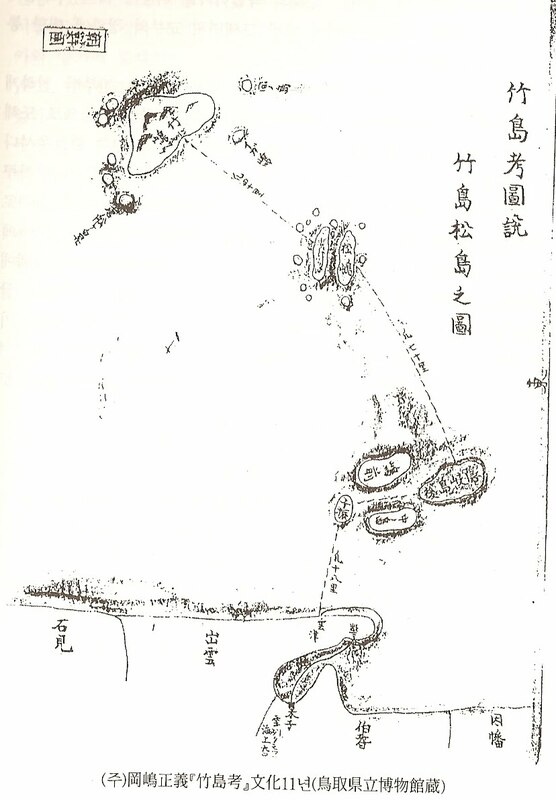 The above maps show that Usando was Ulleungdo’s present-day neighboring island of Jukdo and that bamboo grew there. Usando could not have been Liancourt Rocks (Dokdo), as Koreans claim, since Liancourt Rocks does not have the soil needed to grow bamboo. Nevertheless, the question still remains, “Why did Koreans change the name of Ulleungdo’s neighboring island from Usando to Jukdo? The map to the right is a 1696 Japanese map that shows Ulleungdo, Liancourt Rocks (Dokdo/Takeshima), and Japan’s Oki Island. It also shows a small island next to Ulleungdo labelled as “まの島” (Mano-shima). Based on the location of the island, it was almost certainly Ulleungdo’s neighboring island of Jukdo. As mentioned above, the Japanese used to use the name “mano” to refer to a kind of bamboo. The まの spelling here was most likely just an alternate spelling of マノ. The king called Lee Gyu-won forward to give his pre-departure greeting. The king said, “It is called either Usando or Songjukdo (敎曰 或稱芋山島 或稱松竹島), which are both written in the Yeojiseungram (輿地勝覽 – 여지승람). It is also called Songdo (松島 – 송도) and Jukdo (竹島 – 죽도). Together with Usando, there are three islands that make up what is called Ulleungdo. Inspect the situation on all of them. Originally, the Samcheok commander (三陟營將 – 삼척 영장) and the Wolsong commander (越松萬戶 – 월송 만호) took turns searching Ulleungdo, but they were all careless, inspecting only the exterior of the island. This has led to these evil practices. The above article seems to be saying that Usando/Jukdo were the same island, but it is not completely clear. Nevertheless, when Imperial Edit 41 made Ulleungdo a county the following year (1900), only the islands of Ulleungdo, Jukdo, and Seokdo (石島) were mentioned as making up the county. Usando was not mentioned, which suggests that Korean authorities decided to use the name Jukdo instead of Usando. It is unclear to which island Seokdo was referring, but it is seems likely that it was referring to either Ulleungdo’s second largest neighboring island, Gwaneumdo (觀音島), or was used as a catchall word for all the remaining rocky islets around Ulleungdo. Since there are no old Korean maps or other documents that show or mention Seokdo as a neighboring island of Ulleungdo, it seems more likely that it was used as a catchall word. 鬱島郡 西面居 金元俊은 鬱島 東北方 4, 50里에 位置하는 于山嶋(無人島)에 移住코자 移住民을 募集하고 探索키로 決定하였으나 10數年前 同地 韓國人이 聯合 探索하였어도 發見치 못하고 海圖에도 없으며 現時 航海路가 頻繁한데도 이를 現認하였다는 일이 없다하여 中止하다. 每日申報 1913.6.22 Kim Won-jun, a resident of Seo-myeon (西面) in Uldo County (鬱島郡), wanted to gather people to migrate to Usando (an uninhabited island), which was supposedly forty to fifty ri northeast of Uldo [Ulleungdo], and decided to search for the island. However, he said that Koreans on the island [Ulleungdo] had tried conducting a joint search for the island [Usando] ten or more years earlier, but were unable to find it. He also said that the island was uncharted, and that even after several trips in search of it, he could notfind it, so he gave up. When the Japanese were defeated in 1945, Korean President Rhee Syngman saw an opportunity to grab some free Japanese land. He did not only try to claim Tsushima, which had been Japanese territory for untold centuries, he even tried to lay claim to an island that did not exist. When it became apparent that the Americans were not going to accept his claims for Tsushima and a non-existent island, Rhee decided to focus his attention on the Japanese island of Takeshima (Liancourt Rocks), which was officially incorporated into Japanese territory in 1905 and had appeared on Japanese maps for hundreds of years before that. However, Rhee had a problem. Korea had no maps or documents to support a claim on Liancourt Rocks. Therefore, Korea started claiming that the Usando on old Korean maps and in old Korean documents was actually Liancourt Rocks, in spite of the fact that the maps showed Usando to be a neighboring island of Ulleungdo, not Liancourt Rocks. The Koreans must have assumed that the Americans would just accept their claim without asking any questions or doing any research, given that the US had just fought a bitter war with Japan and would supposedly have no reason to support Japanese claims. However, the Americans did ask questions and did do research, and they decided that Liancourt Rocks belonged to Japan. In fact, here is what US Secretary of State Dean Rusk told the Korean ambassor to the US. As regards the island of Dokdo, otherwise known as Takeshima or Liancourt Rocks, this normally uninhabited rock formation was according to our information never treated as part of Korea and, since about 1905, has been under the jurisdiction of the Oki Islands Branch Office of Shimane Prefecture of Japan. The island does not appear to ever before to have been claimed by Korea. Realizing that the 1952 Peace Treaty would not give them Takeshima, Koreans decided to take it by illegally occupying the islets, where they are still. Did Koreans just misinterpret the 1952 Peace Treaty? I do not think so. Usando, the old name for Ulleungdo’s neighboring island of Jukdo, is now being used to support a ridiculous Korean territorial claim on Liancourt Rocks (Dokdo/Takeshima). I wonder how long it will take before Korean historians finally get the courage to stand up and tell the truth? Gerry, I found one trivial mistake. (“Jukdo” in Korean and “Takeshima” in Takeshima) was more descriptive? I will make new entry with this translation on Dokdo-Takeshima site tonight or tomorrow. I give up on trying to understand the formatting on this site. If you would like to see how the formatting is supposed to look, you can check HERE. Gerry as I’ve mentioned to you on numerous occasions all of the maps you use as evidence for the identity are seriously flawed in both geographic representation and scale. Next look at one of the maps you use to cite the identity of Ulleungdo. First there are five islands on the south side that are non-existent. If you use the 10ri scale on the side Ulleungdo Island is about 40kms across when in reality the island about 10kms. The non-existant islands would be about 400 meters across. It is not possible these maps were made based on surveys. All of the maps you cite have “phantom 5 island” error and are thus copies of course. Instead of citing maps of questionable accuracy why not simply cite some of the Korean and Japanese historical references that state Usando was what Japanese call Matushima? With regard to the SF Peace Treaty. Gerry, you must be American. Stop pretending America was/is the moral authortiy endowed with the powers to dictate another countries territortial limits. Let me remind you there were many other countries actively involved in the negotiating process. England for example wanted Japan’s boundary to be drawn in accordance with Scap #677 in a precise line. This would have clearly given Dokdo to Korea. See this document. On another note it should be known, the allied powers were not dividing up these areas based on true historical ownership. Chejudo has always been part of Korea since ancient times however this British document gives us insight as to the process by which the “allies” allocated territory. It’s pretty outrageous that the allies were arguing over who gets Chejudo when had to be hundreds of historicals map that clearly showed this island as Korean land from ancient times. Take the SF Treaty negotiations for what they were Gerry. Korean and Japanese wrangling to grab land and allied posturing for Post WWII Cold War and anti-communism. Gerry, you have to pick up your game. When review you whole series regarding the identity it seems it is all based on about half a dozen blatantly inaccurate maps that are obvious copies of each other. What you essentially have is one map and none of these strengthen Japan’s claim to Takeshima in themselves. We know that Anyongbok quoted the distance to Usando as 50ri in 1696, this distance is much to far to be Jukdo Islet. I have given you many documents that show some Japanese themselves considered Usando to be Matsushima (Dokdo) and attached to Ulleungdo. You left out some critical data with regard to Leegyuwon’s converstation with King Gojong. Second Leegyuwon said the distance to Songjukdo was 30ri. much too far to be Jukdo Islet in both Korean and Japanese ri. The distance of 30ri was the same distance given is some Japanese documents. All maps prior to the Japanese military annexation of Dokdo fail to show the island as Japanese territory. It is also true that in 1695 the Shogunate inquired to Tottori Prefecture about both Takeshima and Matsushima. They concluded that both islands did not belong to Japan. After this document Japan banned passage to Ulleungdo Island. 1. Since when did Takeshima become attached to the two prefectures of Inbashu and Hokishu? 2. How big is Takeshima? 3. Since when have people started going there for fishing? 4. Two or three Koreans were brought here three or four years ago for fishing there. Had they come there before that? 5. How many vessels and how many people went to Takeshima (Ulleungdo) last year? 6. Are there other islands belonging to the two prefectures of yours. The important answers were as follows. 1. Takeshima does not belong to Inbashu or Hokishu. 2. The island is about 9ri around (36kms). 3. Including Takeshima (Ulleungdo) and Matsushma there are no other islands belonging to the 2 prefectures. I am always puzzled about this matter. Didn`t the San Francisco Peace Treaty settle this? Japanese governments interpretation of the treaty is that they did not abandon Dokto/Takeshima. Are there countries which agreed with the treaty that is objecting to the interpretation of the Japanese government? If there is, there may be a chance that the interpretation is wrong. If there is not, why should Japan abandon Dokto/Takeshima? I always thought treaties will bind countries that agreed with them. And those who have the right to object against some interpretations are the countries which took part in them. Am I wrong? Is it wrong to compare them with contracts? 1.A and B agrees that A renounces all right, title and claim to C.
2.C is not satisfied with A`s interpretation. 3.Does C have the right to complain? 4.I consider only B does, but am I wrong? And why was Dokto/Takeshima excluded from the treaty on the first place? Egg, Japan didn’t abandon Dokdo, they were legally obligated to cease exercising sovereignty over the island by the terms of surrender after WWII. Scap 677 excluded Takeshima from the definition of Japan and no further directives were issued on the matter. Japan had no say on the matter as they agreed to these terms legally empowering the allies to define her territorial boundaries. People on this forum have been misled to believe that America was the only allied country involved in the negotiations with Japan involving the final decisions regarding the sovereignty of outllying islands. However, as shown above the British wanted Japan’s boundary to continue as defined in 677 and the Americans wanted to give Takeshima to Japan (for strategic~military reasons) The issue became too contentious to handle and the allies decided to leave things as it were. From what I understand five drafts of the SF Peace Treaty prior to the last ceded Takeshima to Korea but intense lobbying by the Japanese changed the Americans’ mind. But I would thank you more if you answered directly to my questions. You are suggesting that it was not the San Francisco Pease Treaty but Scap 677, right? Are you saying that San Francisco Pease Treaty should not be considered when discussing about the territorial probrems? What made Japan cease exercising sovereignty over the island concretely? Egg, the allies had made a determination on the fate of Takeshima. A Korean article describes the situation best. Egg, Japan was forced to cease exercising authority over Takeshima. The definition of effective control is exercising a minimum degree of sovereignty over a territory which Japan was legally bound to stop. How can one maintain title over a territory to which they have neither effective control or sovereignty over? At any rate, I don’t put much faith in the “negotiating” process the allies were conducting after WWII. It was a much different Asia in 1945. It’s clear the Japanese and Koreans were trying to grab land, and the allies were trying to get a foothold on the Asian mainland and attempting to stem the invasion of communism in Northeast Asia at this time. The whole process of dividing land in Post WWII was tainted and agenda driven and had nothing to do with a true historical study over genuine ownership of lands. I also don’t agree with the process by which Japan acquired Dokdo in 1905. The Japanese say under “international law” the annexation of Dokdo was legal. International Law at the turn of the 20th Century has to be taken into proper historical context. These “laws” were drawn up the colonial powers to seize land from people deemed “uncivilized” or “not enlightened” The codification of “international law” with regard to territorial acquisitions was undertaken as the Europeans were siezing land on the African continent, America and Australia. It’s debatable, this “International law” said countries could put up a flag on any land without notification and claim it as “terra nullius” which is basically what Japan did to Dokdo. There are historical references from those who were involved in the process that Japanese were concerned Dokdo was Korean land. But still they seized an island 200kms from the nearest Japanese landfall and within visual proximity of Korean territory without any consultation. Some argue this was legal. But I say legal or not it’s BS. The Japanese took lands all over Northeast Asia. Taiwan, the Liandong Peninsula (Dalian) and they took Hokkaido from the indigenous peoples and displaced them. Then they marched into Korea and colonized the country. I’m not mentioning this to demonize the Japanese. The point I’m making is, to me it is very appalling that all of these land grabs were deemed “legal” under the “international law” of the day. It is these colonial era “laws” that Japan cites in her claim to Dokdo. Sorry, are you suggesting that laws (at least laws before 20c =colonial era laws) should not be considered when deciding territorial probrems? Or laws should be interpretated under the historical context? If so, what do you think about the US owning Hawaii or Australians excluding aborigines (since you mention about Hokkaido) owning Australia? Are you against them? SUBJECT:Governmental and Administrative Separation of Certain Outlying Areas Japan. 1. The Imperial Japanese Government is directed to cease exercising, or attempting to exercise, governmental or administrative authority over any area outside Japan, or over any government officials and employees or any other persons within such areas. (c) the Kurile (Chishima) Islands, the Habomai (Hapomazo) Islands Group (including Suisho, Yuri, Aki-yuri, Shibotsu and Taraku Islands) and Shikotan Island. 6. Nothing in this directive shall be construed as an indication of Allied policy relating to the ultimate determination of the minor islands referred to in Article 8 of the Postdam Declaration. SCAP Instruction #1033 that became the origin of the MacArthur line. 3. (b) Japanese vessels or personnel thereof will not approached closer than twelve (12) miles to Takeshima (37°15′ North Latitude, 131°53′ East Longitude) nor have any contact with said island. 5. The present authorization is not an expression of Allied policy relative to ultimate determination of national jurisdiction, international boundaries or fishing rights in the area concerned or in any other area. Administration of Okinawa ultimately returned to Japan but Okinawa never became US territory. Administration of Liancourt Rocks ultimately returned to Japan but they never became Korean territory. Administration of Takeshima returned to Japan Opp? Very interesting do you want to show us which part of the San Fransicso Peace Treaty states that? toadface, It returned to Japan when SCAPs became ineffective when SF treaty came in effect. SF treaty just mentions the territory Japan renounced including Utsuryo (Ullung) and Kuelpart (saishu or Cheju) Islands but not Liancourt Rocks (Take Island), thus Liancourt Rocks stay under Japanese administration. Opp, Japan’s national boundaries were defined before Scap by both the Cairo Convention and the Potsdam Declaration. Without an explicit instruction Japan cannot exercise sovereignty over Takehima. Japan is bound by the terms of these documents to cease exercising sovereignty over island. It was in this state the SF Peace Treaty was concluded. Japan’s national boundaries were defined before Scap by both the Cairo Convention and the Potsdam Declaration, toadface? Very interesting. Do you want to show us which part of them states that? Don’t you wonder why SF treaty state the territory Japan renounced such as Utsuryo (Ullung) and Kuelpart (saishu or Cheju) Islands? And even further rocks were predetermined as Korean territory?